REDUCED TO $399,000.00US or $798,000.00BZ Negotiable! This is a home for someone who is looking for the right place to settle in and relax and forget about the hustle and bustle of the city life. This home is ideal for those wanting to escape from the frigid cold or for those who are ready to wind down in life and to enjoy their hard work in a place like Belize! This 2-storey home is ideal for many uses. The home is great opportunity for a mix usage of rental income since at the Burrell Boom junction there is a medical university and students are always searching for rentals. Also, with great growth in demand for rental units as in Air B and B this property could be rented it to those travellers wanting affordable housing. The home is divided into 3 units which of 2 are being rented earning rental income. The ground floor units are the ones that are being rented to long and short tenants. The first unit consist of 1 bedroom, 1 full size bathroom, kitchen, dining and living room. The second unit is a larger area with 2 bedrooms, 1 full size bathroom, living area, kitchen and dining area. The third unit is the upstairs which is a single family dwelling consisting of 3 bedrooms, 1 full size bathroom, master bedroom with master bathroom and private veranda overlook the beautiful farm across from the property, full size kitchen with well-kept cabinetry, recessed lighting, dining and living room also boast of recessed lighting and popcorn ceilings, utility room and rear steps leading to the downstairs. The entire home is fully tiled and burglar barred. The owners address any maintenance issue to the building and the lots are well manicured. The entire perimeter of the two lots are on 3 blocks above the ground with chain link fence on 3 sides, on the main road access the fence is approximately 6 feet high concrete block fencing. All utilities are on the property including, potable water, cable, internet, phone service. 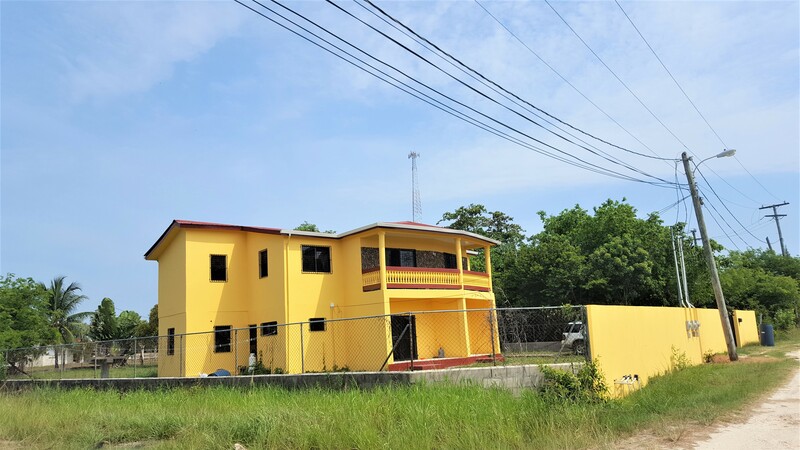 This lovely home is approximately 4.5 miles to Ladyville where you have large shops and fuel stations and the international airport is approximately 5.5 miles from the property. Belize City is approximately 13.5 miles from the property. Owner may consider selling the home on lot 11 or sell lot 10 or as a package. Contact for full details. Book a tour! << CY75: UNDER CONTRACT! 10.231 Acres adjoining Christian School Academy!